I am speaking at a private exclusive event in Malibu curated and facilitated by @AnnaLundgaard Founder of WITMA (Well-being in the Modern Age). This event is a FREE offering and limited to 20 RSVPed guest. First come first served. Please be kind to ONLY RSVP if you are intending on going! *After RSVP’ing you will receive a confirmation email and the address. Join me as I lead this powerfully transformative workshop on how to use the power of mantra, meditation, pranayam (breath), Kundalini yoga, and intention to transform any challenging life situation into a catalyst for personal growth and expansion. You will learn how to create and widen the critical gap of separation between the egoic instincts and the calculating, negatively biased mind. By using present moment awareness, scientific prayer, and the power of your breath, you will learn how to access your true soul identity hidden behind the false self, and to live a life motivated by the power of unconditional love. I’ll be talking about how to jumpstart and activate your morning, going over routine and practices you need to do to stimulate your body with dopamine, serotonin and cortisol for immediate energy in the morning as well as discussing all the ways you can enhance your neural output for more productivity and creativity. Bring yoga mat, cushions, and a pen and paper! (WITMA) IS A LIVE POP-UP CONVERSATION SERIES FOCUSED ON PRACTICAL METHODS FOR LIVING A HEALTHY AND CONNECTED LIFE. Mercado Sagrado is a celebration of the canyon spirit featuring musical performances, organic food, lectures, workshops, hand-made & artisan goods, film screenings + experiential activities such as intuitive readings, sound baths, aura photography, vibrational medicine & more. I'm honored to be invited as speaker for STRONGTALKS, a regular series of talks with some of our favorites in the fields of wellness, biohacking, health, fitness and spirituality. Join me! Find out more about OSTEOSTRONGLA. Come join me for yet another dope speaking event at Forefront Talk Series, presented by NEXT | HEALTH. Learn more about Forefront's mission below. Forefront by Next Health is a platform for a community seeking optimize their lives. We bring a collective a industry leaders marching forth a movement that will ultimately disrupt the current design of the healthcare system. Our shared passion for true health is vested in the desire to change lives for the better by immersing in proactive health & to define a new category that is health optimization. Forefront is built community, giving back to the community & igniting the community with inspirational information that will ultimately allow them to make healthier choices & to become passionate about living life to fullest & increasing our health span. Join me in this panel discussion and Q&A. We will explore different mindfulness tools that can help us to stay present, resourceful and resilient, allowing us to enhance a purposeful working life and personal life to set ourselves up for success. FREE EVENT. Sign in here. Here's a chance to Get meet this here hacker, on June 14th, at Bulletprof Labs. I'm excited to join the team at NEXT|HEALTH celebrate their new location in LA. They are bringing the future of health and wellness to Westfield Century City, I'll be there to support them in their ribbon cutting celebration as part of their thought discussion panel of leaders and influencers in the cutting-edge health & wellness. I'll be presenting at Paleo f(x) this year. Have you been? It's the largest gathering of Paleo / ancestral health / keto / functional medicine / strength & conditioning experts in the world. Use code LUKE35 for 35% off premier & VIP tickets! Luke live streaming and podcasting with notable guests! 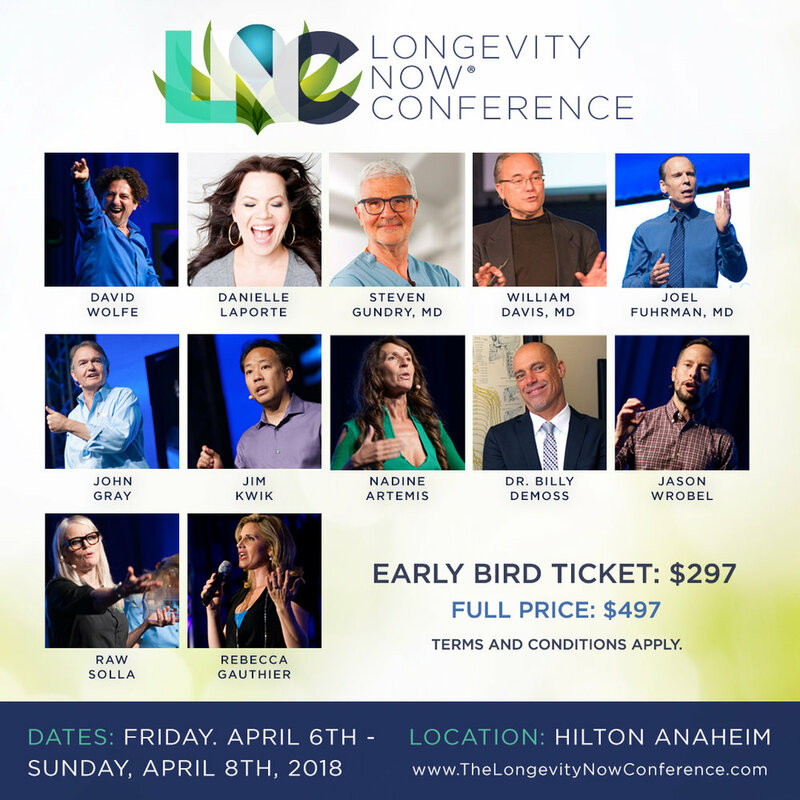 The Longevity Now Conference is a 3-day transformational health/wellness event. This is their 15th year. I will be attending and recording tons of interviews, live streaming and podcast recordings. Come say hello! I'll be one of the panelists for this rad event. My panel's theme: Modern Day Spiritual Enlightenment. The guests on my panel are sick! To be announced... Join me! WITMA (Well-being In The Modern Age) is a live pop-up conversation series focused on practical methods for living a healthy and connected life. Bringing together leading voices from across the wellness, creative and media worlds, WITMA provides a space for discussions centered around creating a greater awareness of our internal and external worlds. 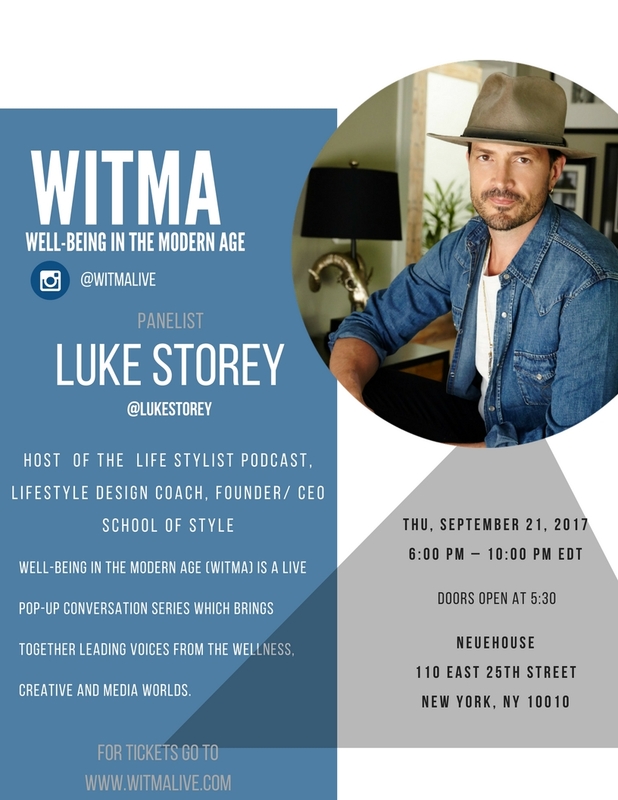 Focused on examining practical methods for living a healthy and connected life, WITMA is a live pop-up conversation series which brings together leading voices from the wellness, creative and media worlds. Still riding off of the thrilling success of our foundational event on September 21st, 2017 at Neuehouse NYC, we have decided to bring WITMA to Los Angeles. With 300 physical attendees, an average panelist reach of about 1.5 million+ impressions, a live-stream audience of 90K during the event - not to mention our massive podcast coverage on numerous channels still being downloaded in the months following the event - we are excited to continue the momentum and take WITMA to the next level in at 10.000 sqft huge private space at Neue House Los Angeles with 800+ invited guests. We are excited to offer panelists shared stage time with other incredible talented beings, and thrilled to have enlightening information shared as the discussion evolves. Knekt.TV will be covering all the panel talks ready for live streaming and interviews with individual panelists to be downloaded afterwards. The exposure and outreach will be prolific. Our event will be on a Saturday, March 24th, at NeueHouse Hollywood the most on the pulse, collaborative workspace, hosting a beautiful mix of cutting edge entrepreneurs and mindful creatives. In taking this high-vision series to the west coast, we are expanding to a day-long event for attendees of all ages to interact not only with brand partners, title sponsors, and panelists but with each other in discovery and support of education and empowerment. An event unlike you’ve ever seen before, The Most Interesting Man in the World Intensive is a 3-day event (for men only) where we break down the different elements of what makes someone truly interesting and install them in YOU so you walk away with the ability and skills to confidently OWN any room you walk into and leave a unforgettable impression wherever you go. It's how they make you feel when you're in their presence. And what is that feeling? It's the feeling of not wanting to be anywhere else in the world. Of not worrying about what's going on in your life because you're so caught up in the moment with that person. They make you feel entranced, fascinated, absorbed while you're with them - like a flow state of companionship and togetherness. And that feeling is something that you become addicted to and miss when you're not in the presence of this person. At The Most Interesting Man In the World Intensive, you're going to learn how to give that feeling to every single person you meet. I'll be appearing at Bulletproof's FIRST EVER BP Labs Community workout this Thursday, alongside founder of Align Aaron Alexander. Aaron was a guest on The Life Stylist Podcast, if you missed this 2-part episode take a listen, then come hang with us: Biohacking Your Body/Mind Connection Pt1 and Pt2. Free Collagen Bars, Bulletproof Coffee, and special giveaways from Aaron Alexander to all those who attend. Join us in our mission to create a community of individuals dedicated to transforming into their best selves! Join me and 30+ other global leaders for this live event, sharing our secrets for unleashing creative potential. You've heard of TED talks, well this is kinda the same but really different. What is a YOG? It stands for Young Older Guy, but means more than a status, it's a way of being... a lifestyle. The concept is that men typically come of age or become the "Older" guy around 35, and the challenge is remaining young in mind, body and spirit while accepting and embracing the aging process. This event is about empowering men to own their YOGness, and to live a life of honorability, integrity, authenticity and a full life of no regrets. Join ME, Kara Erickson, creator of the Intuitive Holistic Healing series AND Leah Mendelson + Eli Block, Lead Teachers at OneTaste LA, for an evening of healing discussion and teachings on how to expand your consciousness through pleasure and what it means to live an orgasmic lifestyle. The evening will include breath work, a chakra balancing meditation, intimacy building exercises, and a panel-style discussion/Q&A. All attendees will receive a gift bag with ticket purchase. More details and time for this event coming soon, stay tuned! FREE Bulletproof Conference Party With Jaiya! Come join me next Thursday, October 12th, as I kick off the 5th annual Bulletproof Biohacking Conference with an epic pre-conference party and live podcast recording session featuring Jaiya at the Downtown LA Bulletproof Coffee Shop! Fresh, cold spring water from Live Spring Water delivered straight from the source. Hello my beautiful tribe! Come join me at this epic event. Click here to learn more and register. Note: TICKETS ARE $75. USE THIS SPECIAL LINK FOR A $10 DISCOUNT PROVIDED BY YOURS TRULY HERE. SALES END SEPT 19. Want to know all about Nootropics? Join me! A documentary screening + panel conversation about nootropics between Luke Storey, Mansal Denton and Dr. Andrew Hill. A FREE event at Soho House West Hollywood where I'll be presenting my mind, body, spirit solution program. RSVP quick if you want to join. Just shoot me an email here with subject "RSVP Hollywood". I'll email you back with details. If you don't hear from me, no offense, the event is filled out. Hope to see you.